Rahamat Ullah Tanvir, an FAU graduate civil engineering student, was awarded the American Water Works Association’s 2018 Roy W. Likins Scholarship in the amount of $5,000. This prestigious scholarship is granted to exceptional upper level undergraduate or graduate students enrolled in an accredited Florida institution that are majoring in an area related to the drinking water industry. Since the scholarship was named in 1991, Tanvir is the third student from FAU to have received this award. Students are evaluated on the basis of their academic performance, work experience, community and civic activities, honor, career goals, letters of recommendation, and evidence of leadership, motivation, character, and self-reliance. SURF projects are ten-week, intensive summer immersion research experiences for FAU undergraduate students. Each SURF award allocates funding in support of each chosen project. The funds are used to support the student researcher during the summer, materials and supplies, and an amount for the faculty to use as a supplemental stipend, for professional development. Remy Komocsin; Project: Measurement Based Characterization of Open Ocean Turbulence for Ocean Current Energy Applications; Faculty Mentor: James VanZwieten, Ph.D.
Scott Shirley; Project: Understanding Catalytic Activity of Polymers for CO2-NaCl-H2O Interactions; Faculty Mentor: Mike Kim, Ph.D.
Vithulan Suthakaran; Project: Developing a Biologically Based Artificial Leaf to Filter and Transform Carbon Dioxide Emissions into Oxygen via Photosynthesis; Faculty Mentor: Peng Yi, Ph.D.
Three teams of students from FAU’s College of Engineering and Computer Science recently took home a cash prize for winning FAU’s IoT Hardware Hackathon, Make FAU 2018, an annual event held during National Engineers Week. The Hackathon challenges teams to use their engineering skills to build and develop hardware applications. The three winning teams, Team 2, Team 5 and Team 13, each took home a $100 prize. 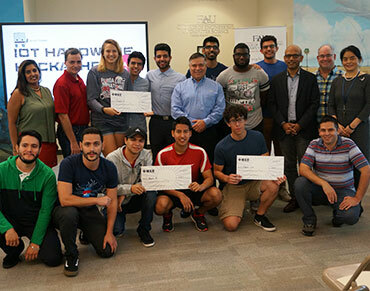 Team 2 included M. Kaan Tasbas, Adam Prey, Kavita Bran and C. Leo Herrera, while Team 5 included Juan Andoinaire-Villalobos, Greco Pinto Anguita, Luis Loreto and Santiago Alzalte Hurtado. Team 13 included Pablo Adell, David Izquierdo, Benjamin Dorcelus, Justin Dunn. 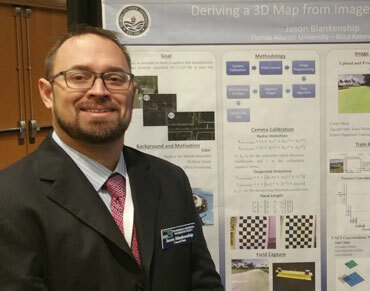 FAU graduate civil engineering student, Jason Blankenship, B.S.G.E. 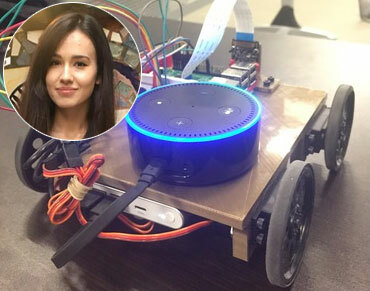 ‘17 won the Francis H. Moffitt Memorial Scholarship at the American Society for Photogrammetry and Remote Sensing (ASPRS) Annual Conference and International Lidar Mapping Forum, that was held February 5 through 7, 2018 in Denver, Co.
FAU undergraduate computer engineering student, Nazik Almazova with her teammates from the University of Pennsylvania won the grand prize at the PennApps XVII hackathon that was hosted January 19 through 21, 2018 at the University of Pennsylvania, in Philadelphia, Pa. with their project "CloudChaser".